Have you been noticing an unpleasant musky smell coming from under your porch or deck and suspect a skunk is living there? Or maybe you’ve seen telltale signs of skunks foraging in your garden or digging for grubs in your lawn. If these sorts of things have you thinking about rounding up chemicals to get repel skunks living in your yard, read on. 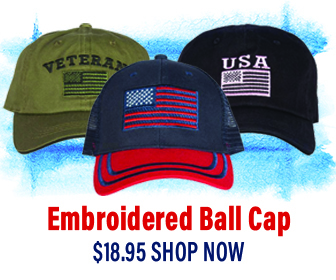 Another approach will bring quicker, more lasting results. February is prime mating season for skunks so if the air is particularly odiferous that is probably why. Encouraging skunks to leave your property is a relatively easy thing to accomplish. They are shy, reclusive animals and truly do not want to confront you or your pets. And when they get cornered and feel vulnerable, they usually give several warnings before using their dreaded defense—that powerful, stinky spray. But things are not likely to get to that point (unless you have a dog who gets interested in the skunk, because dogs don’t tend to heed the warning signs). More on that later—let’s get to some facts about how repelling skunks. Skunks are actually beneficial in several ways—consuming grubs, insects, mice, and baby rats, all things you most likely wouldn’t mind having less of around your yard. But if you are still sure that you’d be happier if they moved elsewhere, take a look at what might be attracting them to your yard and garden. There could be several things that you can easily adjust to make your property a less appealing place for skunks to dwell. If bags of pet food, birdseed, or trash are left unsecured, put them in tightly sealed containers. If birdseed tends to pile up under your feeders, it will attract mice, which skunks and raccoons may prey upon, so keep seed raked up. If you sometimes overwater or water your lawn at night, it brings grubs to the surface, causing skunks to dig, so reduce watering and water in the morning instead. If you leave the doors to your garage, shed, or outbuildings open at night, skunks may wander in and give you a surprise later, so remember to close them up when you’re done. If there are open spaces under your porch, deck, or shed, these could be tempting places to den. After thoroughly checking to be sure no animals are present—especially dependent young—you can seal up the openings to these spaces. (See below for how to check for the presence of animals in places you cannot easily inspect.) Again, it’s often more beneficial (and easier) to just let the skunks stay put since their free pest control services outweigh any disadvantages of having them there. 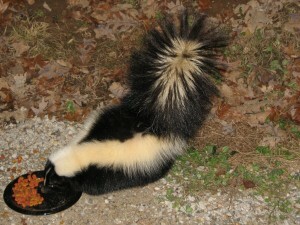 If you feed your pets outdoors, pick up leftover food otherwise Pepé Le Pew may pay you a visit. If you have skunks denning under your porch, deck, or shed and want them to leave, try applying gentle harassment techniques. But, first, be sure to wait for warm weather if it’s winter, or wait for any young to be mature enough to follow their mother out of the den. Check with your local cooperative extension office or rehabilitator to find out when skunks are likely to have dependent young in your area to be sure you don’t separate a family and cause the young to perish. Once you’re sure you have a green light to proceed, loosely fill the den entrance with straw, leaves, or soil. Wait until it remains undisturbed for three nights. That will mean the skunk has moved along—and taken her young, if any were present, with her. Then, you can close off the opening with heavy-gauge wire mesh. If, for some reason, the materials keep being pushed aside so the skunks can keep using the space, try placing used kitty litter near or inside the den. 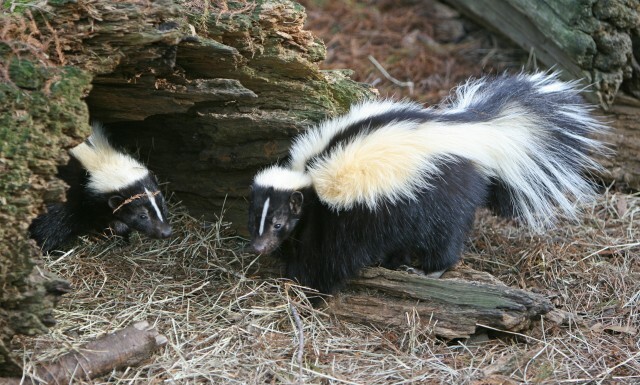 Its offensive smell will provide a stronger incentive for the skunks to leave. Another option is to focus a flashlight and put a blaring radio into the den a couple hours before dusk. Skunks prefer a quiet and dark denning spot, so these disturbances will make the space less acceptable as a home. In the unlikely event that none of the above ideas worked on your particular skunk situation, maybe it’s time for a little help. If you decide that’s the case, follow these guidelines for finding a responsible wildlife control company—one that will handle the situation effectively and without causing unnecessary harm to the skunk(s) in the process. As mentioned earlier, dogs—bless their innocent, curious natures—do not typically know what to make of a skunk’s warning signs, and can end up with a good dose of a skunk’s best defense on them. You can opt for an effective commercial product to freshen up your dog, or you can mix up something that will work just as well with common household products. Mix a quart of hydrogen peroxide, ¼ cup of baking soda, and a teaspoon of liquid dish soap in a bowl, then use a washrag to bathe the dog thoroughly with this mixture, rinse, then shampoo and rinse again. The bad odor will be magically gone. If your dog was sprayed in the face, expect bad breath for a prolonged period. Hopefully he’ll remember his experience if he has an encounter of the skunk kind again—but don’t count on it!